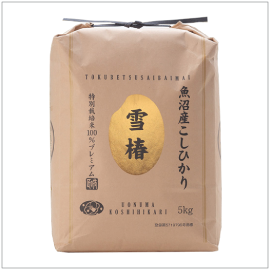 This extremely rare and premium Koshihikari rice comes from less than 0.003% of the Koshihikari rice grown in Uonuma region. The soil used to grow Yuki Tsubaki is prepared using four times the standard cost and manpower and the polishing process takes three times longer compared with other white rice. Frequently receiving awards at the International Contest on Rice Taste Evaluation, Japan's largest contest for rice, Yuki Tsubaki is favored by discerning, high-end establishments in Japan.